Oakland's Beth Terry is almost doing it. Terry's book, Plastic Free, is out next month. Read her blog at MyPlasticFreeLife.com. Beth Terry finds plastic in the most unexpected places: lining the inside of ice-cream cartons, coating the metal lids on jars of pasta sauce, and hidden in wine bottles' colored collars. Speaking of wine, synthetic corks are made of plastic. So are chewing gum and cigarette butts. Identifying plastic is one thing; avoiding it is another entirely. But the Oakland resident has made it her personal (and, with her new book, professional) mission to eschew plastics wherever they may be — which, it turns out, is just about everywhere, from the kitchen to the bedroom to the bathroom. Even eco-warriors may be stunned upon a moment of reflection: Your toothbrush? Plastic. Your floss? Coated in plastic. Your soap? Packaged in plastic. It goes on and on. Five years ago, when Terry was still a plastic "addict" who regularly trashed, not recycled, water bottles, and who subsisted rather heavily on frozen foods — packaged in plastic trays in plastic-lined boxes — Terry read an article in Men's Health about plastic pollution in the world's oceans. The story was accompanied by a picture of the decomposed carcass of a Laysan albatross chick, its stomach filled with plastic bottle caps, disposable cigarette lighters, even that plastic toothbrush — the sort of stuff most of us use up and dispose of on a regular basis without giving it a second thought. Terry decided then and there to make a change. In the first month alone, she found that she discarded roughly 3.5 pounds of plastic — and that didn't include a huge bag full of grocery bags she intended to reuse and water bottles she'd disposed of at the gym. Nor did it include many items she didn't even realize at the time contained plastic, like cardboard cups, cartons, and containers coated with plastic. 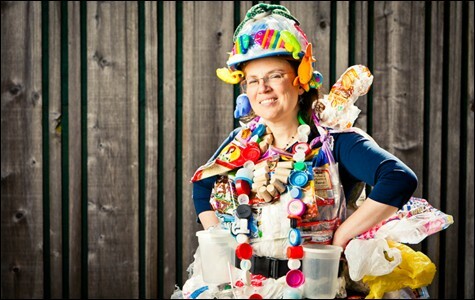 In all of 2008 she used only 5.1 pounds of plastic; in 2009, 3.7; in 2010, 2.2; and last year, 2.1. Today, Terry is one of the nation's leading authorities on sustainable plastic-free living in an industrialized society. The word sustainable in this case applies not to the environment but to lifestyle: Now that Terry has worked out the kinks and identified the best local resources, she could go on living comfortably sans plastic for the foreseeable future. "I didn't try to do it all at once, because I would've just quit," she explained. Going plastic-free was not a single decision; that would have been too overwhelming, and she likely would have burnt out years ago — as have many of her predecessors and followers. Instead, it's taken a series of hundreds of small decisions, many of which soon became habit, although she recognizes that her experience is not universal. "I'm not suggesting that anyone live the way I do," she said. "I just want people to see what's possible." Terry has blogged her anti-plastic adventures, and this spring her tips (and tribulations) take the form of a full-fledged, plastic-free book, Plastic Free: How I Kicked the Plastic Habit and How You Can Too. It's out next month on Skyhorse Publishing; pre-orders and Amazon e-books are available now. 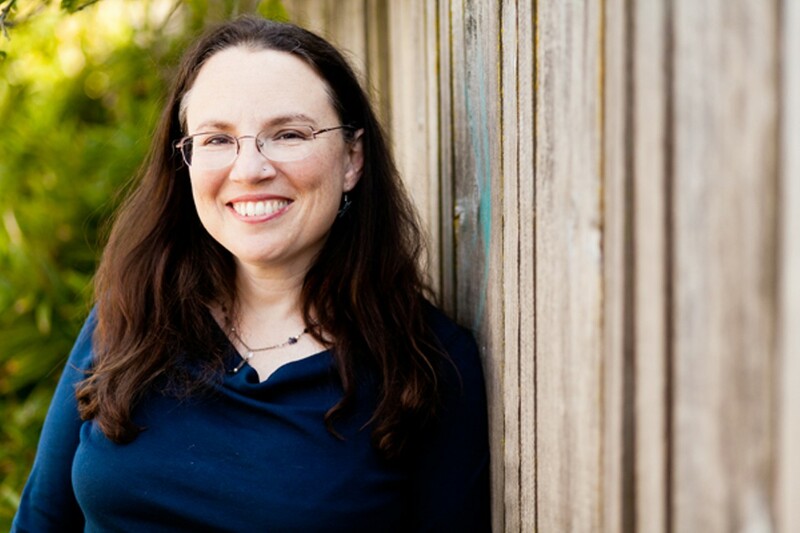 With its release, the ersatz activist and self-taught expert, who lives in Rockridge with her husband Michael and works three days a week as an accountant, officially adds "author" to her résumé . The 330-page book is written in a conversational, engaging tone. It's far from your typical anti-plastic screed. Terry talks about plastic the way The Story of Stuff author and eco-celebrity Annie Leonard talks about stuff: Although the problems Terry discusses are complex and often serious, a reader's first instinct is to be inspired, not cower in fear. Terry also is steadfastly down to earth: a regular person who has merely taken a familiar impulse and seen it through to its logical end. She relies on widely available resources — like Whole Foods' Berkeley store, where she recently agreed to demonstrate the ins and outs of plastic-free shopping. Arriving by bike — she doesn't own a car — she came equipped with stainless-steel tiffins, a few Mason jars, and reusable cloth and paper bags, ensconced as always in her purse, and quickly got to work. The results were eye opening. Aisle after aisle, it's a plastic world, and we're just shopping in it. In the produce aisle, stickers and ties contain plastic. In the freezer aisle, "everything is plastic," much to Terry's chagrin. "In the beginning," she said, "I bought everything just to see what was inside." In the beverage aisle, screw tops and bottle caps are lined with BPA. In the cleaning aisle, powdered laundry detergent is sold with a plastic scoop. In the personal-care aisle, all-natural toothbrushes are packaged in bulky plastic blister packs. In the makeup aisle, not a single product is plastic-free. Cheese, tortillas, energy bars: only available in plastic packaging. Even the groovy socks capping one aisle are sold on plastic hangers. The store's redeeming value, as Terry sees it, is the bulk-foods aisle. She buys almost everything in bulk and what she can't find at Whole Foods she buys at Berkeley Bowl, Market Hall, the farmers' market, San Francisco's Rainbow Grocery, or a number of other local standbys. She buys unpackaged bread at Great Harvest or La Farine, and meat (which goes straight into a stainless-steel tiffin) at Ver Brugge, all located near her home in Rockridge. She knows she's fortunate to live so close to these sorts of places, especially considering she doesn't have a car. It's hard to imagine someone who lives in, say, Antioch, being nearly as successful at living plastic-free, regardless of their resolve. What Terry can't buy from local stores she makes at home, using recipes she drummed up or found online. She makes shampoo, ginger beer, granola bars, and more — processes that she insists have become second-nature and don't require much more time or effort than simply going out and shopping. Once she tried to make liquid soap — only available in plastic containers — by melting down solid bars. The experiment was a bit of a failure, as the chemical composition of the two products is different, but eventually she found a passable recipe. Financially, the added cost of buying all-natural materials may sound expensive, but for Terry, it could be a wash, since she has drastically cut down on her consumption of durable goods (she even avoids synthetic fibers in her clothing). What she does buy she picks up secondhand. The only consumable plastics left in her home, she guesses, are spice containers that have been sitting on the shelf for years. Terry closes Plastic Free with a chapter titled "Nine Reasons Our Personal Changes Matter." While she engages in some activism of her own — in 2008 she led a successful campaign to convince Oakland-based Clorox, which owns the Brita water filter company in North and South America, to begin recycling its plastic filters — she also holds steadfastly to the belief that individual actions like those outlined in her book are worthwhile. "While simply changing light bulbs, carrying our containers to the grocery store, and tallying up our personal plastic waste are not enough to reverse the course of environmental degradation, our individual actions are not irrelevant," she writes. "They matter." She proceeds to give nine reasons why — e.g., we can vote with our wallets, learn to be more self-sufficient, connect with our communities, expose flaws in the system, set an example for others — and for the most part she's convincing. However, she's also right in allowing that systemic change is ultimately most effective. That's why she's heartened to hear that Alameda County has banned plastic bags at food-selling retailers and large pharmacies beginning next year. With all she has done, few things are more frustrating than leaving Whole Foods, reusable containers and plastic-free goods in hand, only to watch plastic bags tumbling on the wind across the parking lot.